By now, everyone knows distracted driving is wrong, but a surprising number of consumers still do it anyway, particularly if they don’t think they’re going to get caught or judged by someone else. Using research that shows people will drastically reduce their texting and driving rates if another person (particularly a child) is in the car with them, AT&T is launching the latest iteration of its 6-year-old “It can wait” anti-distracted driving campaign with a brutally shocking television commercial and an eye toward looking into the behaviors that cause people to ignore the dangers they know exist. A new television spot (from BBDO), which begins airing Labor Day weekend, depicts a man driving with a boy on a winding two-lane highway when he gets a text. The boy tells his father to check the text, to which the father responds: “Never with a child in the car.” The boy says it’s okay, because he’s not really there and disappears, leaving the father feeling free to check the text. 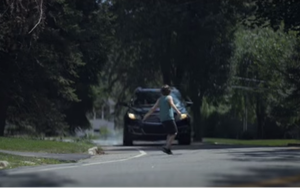 As he does so, the boy reappears as he chases a ball into the street around a curve, and the spot ends just before a tragic accident occurs. “You’re never alone on the road. Distracted driving is never ok,” reads onscreen text. The concept was born out of research that showed 64% of consumers have used a smartphone while driving alone in the car. That number drops to 36% if there are passengers in the car. If one of those passengers are children, the number drops to 30%. “So we looked at ways to explore this finding, along with others from over the years, in a new light — behavioral economics, a field of social science research that examines why people do what they do,” Howard says. Such research is fueling a new iteration of the “It Can Wait” campaign. The company will be exploring behavioral and social economics (including working with the economists behind Freakonomics, behavioral science not-for-profit ideas42, and other experts) to find the motivations behind such behavior and how to use technology and other tools to drive actual social change.